There has been a significantly weakened global expansion, especially in the second half of 2018. If the downside risks do not materialize and the policy support put in place is effective, global growth should rebound. If, however, any of the major risks materialize, then the expected recoveries in stressed economies, export-dependent economies, and highly indebted economies may be derailed. A year ago, economic activity was accelerating in almost all regions of the world. One year later, much has changed. The escalation of US-China trade tensions, needed credit tightening in China, macroeconomic stress in Argentina and Turkey, disruptions to the auto sector in Germany, and financial tightening alongside the normalization of monetary policy in the larger advanced economies have all contributed to a significantly weakened global expansion, especially in the second half of 2018. With this weakness expected to persist into the first half of 2019, our new World Economic Outlook (WEO) projects a slowdown in growth in 2019 for 70 percent of the world economy. 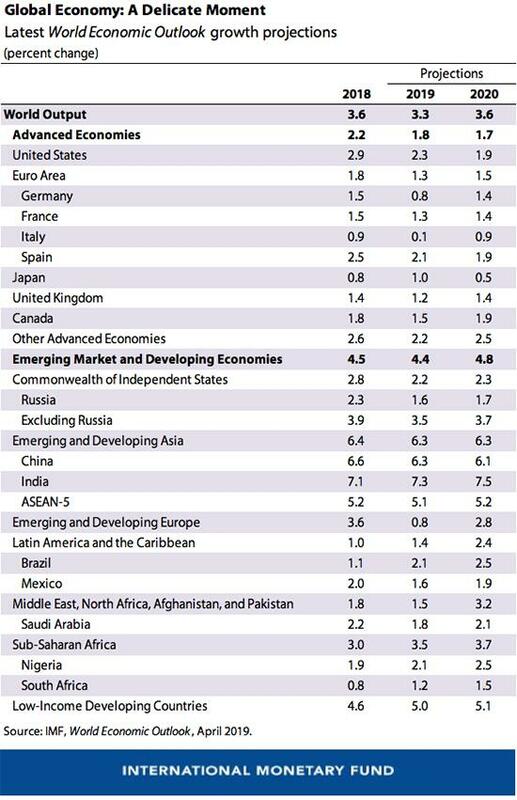 Global growth softened to 3.6 percent in 2018 and is projected to decline further to 3.3 percent in 2019. The downward revision in growth of 0.2 percentage points for 2019 from the January projection is also broad-based. It reflects negative revisions for several major economies, including the euro area, Latin America, the United States, the United Kingdom, Canada, and Australia. While the global economy continues to grow at a reasonable rate and a global recession is not in the baseline projections, there are many downside risks. Tensions in trade policy could flare up again and play out in other areas (such as the auto industry), with large disruptions to global supply chains. Growth in systemic economies such as the euro area and China may surprise on the downside, and the risks surrounding Brexit remain heightened. A deterioration in market sentiment could rapidly tighten financing conditions in an environment of large private and public sector debt in many countries, including sovereign bank doom loop risks. Given these risks, it is imperative that costly policy mistakes are avoided. Policymakers need to work cooperatively to help ensure that policy uncertainty doesn’t weaken investment. Fiscal policy will need to manage trade-offs between supporting demand, protecting social spending, and ensuring that public debt remains on a sustainable path, with the optimal mix depending on country-specific circumstances. Financial sector policies must address vulnerabilities proactively by deploying macroprudential tools (such as counter-cyclical capital buffers) - a task made more urgent by the possibility that interest rates will remain low for longer. Monetary policy should remain data-dependent, be well-communicated, and ensure that inflation expectations remain anchored. This is a delicate moment for the global economy. If the downside risks do not materialize and the policy support put in place is effective, global growth should rebound. If, however, any of the major risks materialize, then the expected recoveries in stressed economies, export-dependent economies, and highly indebted economies may be derailed. In that case, policymakers will need to adjust. Depending on circumstances, this may require synchronized though country-specific fiscal stimulus across economies, complemented by accommodative monetary policy. Lastly, adequate resources for multilateral institutions remain essential to retain an effective global safety net, which would help stabilize the global economy.